DESCRIPTION: This individual development of six apartments is located in a very popular area of Tunbridge Wells. It is walking distance to the town centre and the mainline station as well as Dunorlan Park. The apartment itself is beautifully presented having an open plan living area with two bedrooms and bathroom. It also benefits from a south facing courtyard to the front, off road parking for one vehicle and enjoys a quiet location having a pedestrian-only frontage. To have such a quiet spot whilst being in this central location is rare so an early viewing is highly recommended. SITUATION: The property is set in a most convenient location being within walking distance of the Royal Victoria Place Shopping Centre and Calverley Road precinct, where most of the multiple High Street retailers are represented. Tunbridge Wells main line station is less than one miles distance with its commuter services to London Bridge/Cannon Street, together with the old High Street filled with a wide selection of independent retailers and a little further on, you will find the historic Pantiles with its pavement cafes, restaurants and bars. There are excellent local schools within the area catering for a wide range of age groups with recreational facilities including the nearby Dunorlan Park with its boating lake and pleasant walks, golf, tennis, rugby and cricket clubs, two theatres and a wide range of activities associated with a busy spa town. OPEN PLAN LIVING AREA: This spacious room has a sitting area leading to dining area with double glazed window to front, two radiators, laminate flooring. The kitchen has a good range of wall and base units with wooden worktop, breakfast bar, 5 ring gas Range cooker and extractor hood over, built in fridge/freezer, washing machine and dishwasher, double glazed window to rear, part tiling to walls, inset sink and drainer with mixer tap. Built in store cupboard housing wall mounted gas central heating boiler. 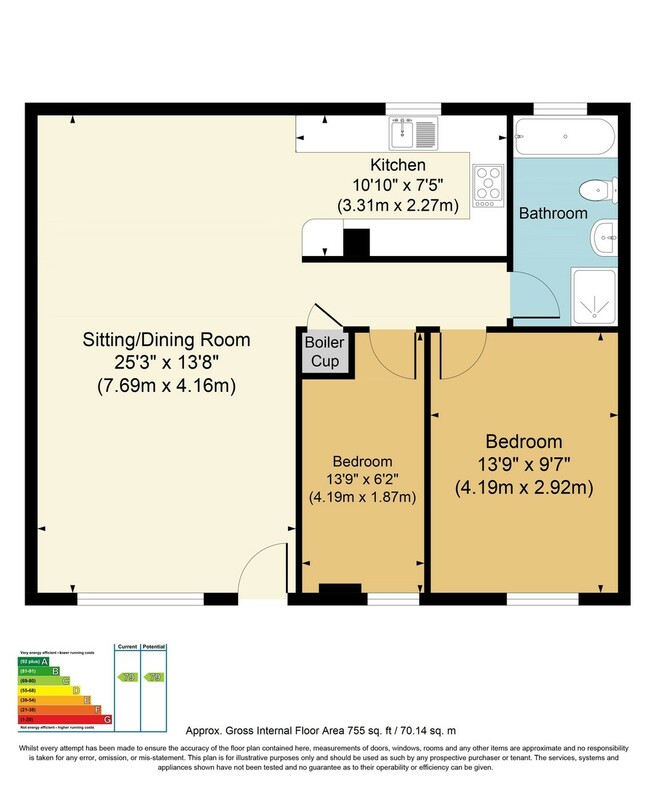 MASTER BEDROOM: A double bedroom with double glazed window to front, laminate flooring, radiator. BEDROOM: A single bedroom with double glazed window to front, laminate flooring, radiator. BATHROOM: A suite comprising both panelled bath and shower cubicle with Aqualisa shower, low level WC, pedestal wash hand basin, tiled flooring, part tiling to walls, double glazed window to rear, radiator, extractor fan. OUTSIDE: A paved courtyard with a southerly aspect with walling to two sides. PARKING: Allocated off road parking for one vehicle.